The Shellstrong Story . . . In November, 2005, at the end of the high school football season, head coach of the Bunt Hills-Ballston Lake Spartans Matt Shell, felt tired. The normally fit and active physical education teacher knew that he was suffering more than the usual letdown that comes once the hectic pace of the football season winds down. He was shocked to learn that he had Stage 2 Squamous cell mouth cancer. The thirty-five year old runner and cyclist had never smoked or chewed tobacco; nor was he a heavy drinker. Still, the father of two pre-school age children was told that he would undergo surgery to remove a tumor from his tongue, and lymph nodes from his neck. In May, 2006, Matt was declared cancer-free. For the next year, he concentrated on regaining his health and on returning to his life with his family. That fall, he coached the Spartans to the school’s first football sectional championship. 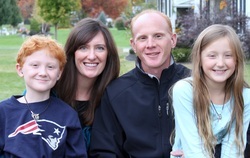 He and his wife, Kim, resumed “normal” lives, raising their children, Jacob and Hannah. In the fall of 2008, Kim, Jacob and Hannah cheered Matt’s Spartans all the way to the Carrier Dome. The following spring, 8 year old Jacob, the red-headed spitting image of his father, began to complain of fatigue and stomach pain. Less than one month later, in May, 2009, Jacob was diagnosed with Stage 4 Neuroblastoma, a rare form of childhood cancer. At 8 years old, Jacob was old for this disease, which usually strikes babies and very young children. Jacob immediately began treatment at the Melodies Center for Childhood Cancer and Blood Disorders at Albany Medical Center. As part of a number of clinical trials for this particularly devastating and hard to treat cancer, Jacob was put on a 14 month treatment protocol. He underwent surgeries to remove tumors in his abdomen and 6 rounds of chemotherapy at Albany Med, followed by a stem cell transplant at Boston Children’s Hospital. In the fall of 2009, as Jacob ventured to Boston for his transplant, Matt’s Spartans were headed once again for the Carrier Dome. Matt spent the weeks in Boston with Jacob and Kim, and the weekends at home with the Spartans and Hannah. With “JS” stickers on their helmets, the Spartans again prevailed until the state championship. Upon returning from Boston, Jacob, whose immune system had been wiped out by the chemotherapy drugs during transplant, was on complete isolation for four months. During this time he was allowed to be inside only at home and at the hospital, where he underwent a month of radiation treatments, followed by 6 rounds of monoclonal antibody therapy, a new and experimental treatment for Neuroblastoma. At the beginning of Jacob’s treatment, the Shells were told that there were no guarantees that Jacob would respond to treatments significantly enough to progress through the entire protocol, let alone be cured. In July, 2010, Jacob was declared cancer-free! In July, 2012, Jacob was declared still cancer-free! Like his father, Jacob will continue monthly checkups and tests for years to come. But these doctor appointments are not currently his focus. He is as busy as any other sixth grader at O’Rourke Middle School in Burnt Hills, playing in his tree fort; taking care of his dog, Daisy; learning to play the drums; and making up for lost time teasing his 10 year old sister, Hannah. He enjoys reading, taw kwon do and being a part of this year’s Spartan team, as ball boy. Throughout his cancer treatment, as Jacob lost his curly red hair, a quarter of his body weight, and half of his hearing (due to chemotherapy drugs), he maintained the same fighting spirit shown by his father during his cancer treatment. Jacob’s positivity, light, and personality attracted the attention and support of people across the Capitol District and beyond, who sported orange “SHELLSTRONG” shirts and showed their encouragement for Jacob and his family in every way possible, from letters to prayer services to carnivals to motorcycle rallies. In May 2010, the Burnt Hills-Ballston Lake community honored the Shell family by naming the SHELLSTRONG Stroll for them. The Stroll was an all-night walk and celebration of life and community that raised thousands of dollars for the Melodies Center, the Shells, and the Giving Tree at the Burnt Hills-Ballston Lake High School. With the release of hundreds of orange balloons into the early morning sky, the SHELLSTRONG Stroll concluded, and the idea of the SHELLSTRONG Foundation took flight. In August, 2011, the Shellstrong Foundation was established as a New York State not-for-profit corporation with the mission to help kids who need it. In its first year, the foundation’s fundraising efforts concentrated on three major community events: Movie Night, Spirits for Strength and the Be Strong Stroll. From the proceeds of these events, the Shellstrong Foundation was able to donate over $30,000 to the Melodies Center at Albany Med, the Double H Ranch, high school scholarships and local families in need! The Shellstrong Foundation enthusiastically looks to the future with the intent to continue its fundraising efforts and spread its message to be hopeful, be involved, and be strong.